Would you like to quickly determine how your customers feel about your company? A Net Promoter Score uses a simple 0-10 scale to collect valuable insights about customer perception of your brand or company. 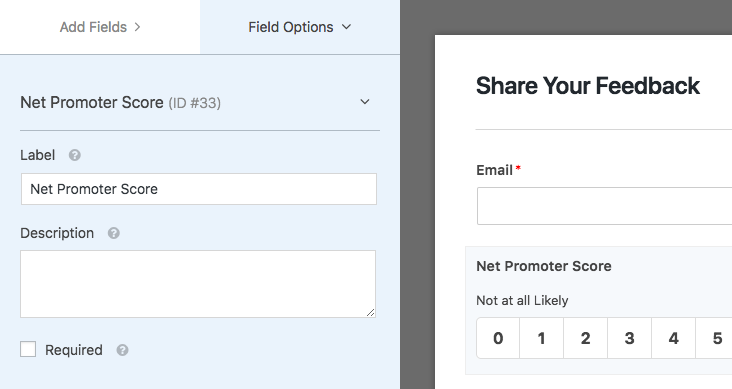 In this tutorial, we’ll show you how to set up a Net Promoter Score field in WPForms. Requirements: You will need a Pro license level or higher to access the Surveys and Polls addon and use the Net Promoter Score field. Users are then provided with a scale of numbers from 0-10, where 0 means that they’re extremely unlikely to recommend your company and 10 means that they are extremely likely to recommend your company. In WPForms, the Net Promoter Score from your forms will be automatically calculated — no need to run the math yourself. We’ll discuss the meaning of NPS numbers, and how to view your Net Promoter Score field results, a little later in this doc. Want to create a scale with custom options? 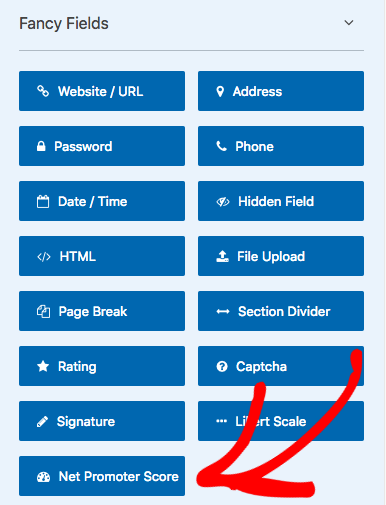 Our Likert Scale field is similar to the NPS field, except that it lets you fully customize each option in your scale. Be sure to check out our guide to the Likert Scale field for more details. Before we get started, you’ll need to install the Surveys and Polls addon. Then, you can create a new form or edit an existing form. If you’d like to get a jump start on your new form, you can use one of our NPS templates. To create a new form with one of these templates, you’ll need to go to WPForms » Add New. Here, you’ll see two NPS-related options under Select a Template. When embedded on a page or post, both templates initially display only the NPS field. Each template then includes conditional logic to display additional fields based on the score a user chooses. NPS Simple Survey Form: Asks users who select a low Net Promoter Score for more details. NPS Enhanced Survey Form: Asks all users additional relevant questions based on the Net Promoter Score selected. It’s not necessary to create a new form to use the NPS field, and you can add this field to any existing form. After opening the form builder to edit a form, you can look under the Fancy Fields section to find the Net Promoter Score field. Simply click the field to add it to the form, or drag and drop it into your form’s preview area. Once the field is added, you can click on it to open the Field Options panel. From here, you’ll have options to rename the field, add a description, and require the field. Once your form is ready, you can embed it on your site and start collecting form submissions. The Surveys and Polls addon can generate lots of useful information for you, but for this tutorial we’ll specifically focus on the Net Promoter Score results. WPForms will calculate all of the values you need for NPS. 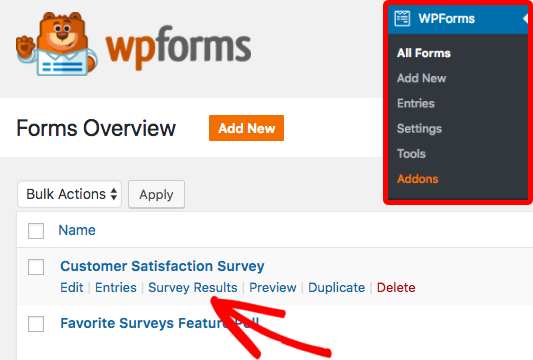 To view your results, you’ll need to go to WPForms » All Forms. From here, hover over the form name to display an extra menu, then click Survey Results. Once you’re viewing the Survey Results page, you’ll be able to easily view your NPS data in a graph and as a table. The table will display the percentage and total number of users who fall into each NPS category, as well as the overall Net Promoter Score based on these values. You can also use the icons in the upper right of the Net Promoter Score field results to switch the graph type. Promoters (9-10): Enthusiastic and loyal. They will likely purchase from you again and, importantly, help promote your brand by recommending your services to others. Passives (7-8): Satisfied or neutral (not particularly enthusiastic or loyal). They will likely not feel strongly enough about your services to promote them in either a positive or negative way. Detractors (0-6): Unsatisfied and not loyal. They will likely not purchase from you again, and may share a negative view of your services with others. The resulting score can range from -100 to 100. A positive score means that you have more Promoters than Detractors, and so generally any positive score is considered good. In general, a score of 50 or higher is viewed as excellent and 70 or more is considered exceptional, though the standards can vary quite a bit between industries. Would you like to collect more details from users who share a particular Net Promoter Score? Conditional logic allows you to show additional questions only to users who select a certain score. As an example, let’s ask customers who share a score of 8 or below (any Passives or Detractors) to share some extra insights. To set this up, you’ll need to open the form builder and add a new field. 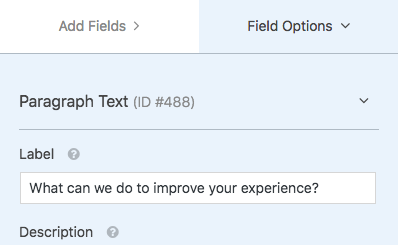 Since we want to ask an open-ended question in our example, we’ll add a Paragraph Text field. 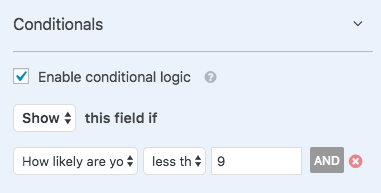 Once you’ve created your new field, you’ll need to add conditional logic. Still on the Field Options panel where you set the field label, open the section named Conditional Logic. Then, go ahead and check the box labeled Enable Conditional Logic. With this rule in place, the field will only display when the user selects a Net Promoter Score of 8 or less. That’s it! 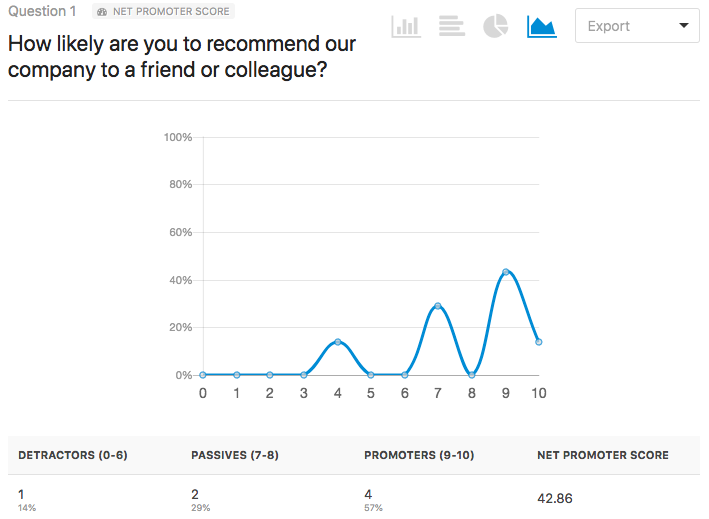 You can now easily survey customers to find out your Net Promoter Score. Next, would you like to learn what else you can do with that survey report? Be sure to check out our tutorial on the Surveys and Polls addon for details on all of the powerful features this addon includes.